A Complete Guide For Men About Styling Lapel Flowers The Right Way! The wearing of a flower in one’s lapel is the least used gestures of elegance seen in modern times. They are a unique seasonal accessory that will immediately set you apart from the crowd and add a little whimsy to your wardrobe. Sure, you could go the traditional route and use a real flower, but a fabric flower will not only last longer, it can also be a conversation starter. You can make them out of just about any fabric, in any color or pattern you want. Four of the most common formally worn flowers are the red carnation, the white carnation, the blue cornflower, and the gardenia. Other flowers that can be worn are the white azalea, miniature roses, delphinium, dasies, lily of the valley, and even statice. Install the flower into the jacket lapel and leave it alone unless it requires adjustment. Heads will turn to the man wearing a boutonniere, so don’t feel self-conscious, rather, let the attention bolster your self-confidence. Don’t fidget with the flower or remove it in the middle of the day, unless its appearance is significantly diminished or the flower is damaged. For most men, the only time they feel it is acceptable to don on a lapel flower is during white or black collar events, like weddings, proms, or opening night. However, There is no right or wrong time to pull out this fantastic accessory. In fact, it is as popular a choice for casual looks as it is for formal attire. 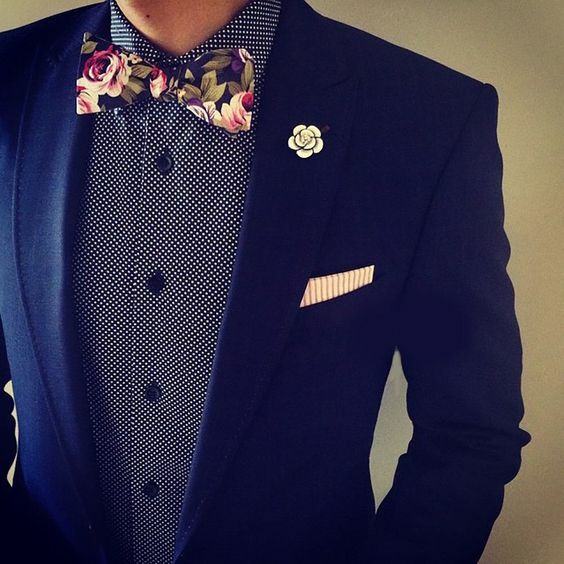 Lapel flowers are an ideal addition to a suit to enhance the outfit. From the office to date night, don’t be afraid to show off the right lapel flower. Admittedly so, lapel flowers and lapel pins seem like a minor accessory. However, when worn and displayed correctly, it will do wonders to transform your outfit. Make sure you choose wisely. The trick with accessorizing is focusing on the “less is more” rule. Understand how accessories complement each other. Our personal choice is the perfect combination of a lapel flower with a complementary, NOT matching, pocket square and tie. Anything more than that should be chosen carefully for fear of over accessorizing. Think the only way to express yourself in a suit or blazer is deciding between a striped button down shirt or a solid button down shirt? Wrong! Lapel flowers and button pins come in so many different sizes, colors, shapes, patterns, prints- they make every outfit look different! You can also have custom accessories made to match your favorite shirt, tie, pocket square, socks…anything! Don’t be afraid to start wearing a lapel flower. Start small, with a button lapel pin. It’s a subtle detail that will allow you to be noticed without making too much of a fashion statement. Then work your way up to brighter and bigger pins and flowers. There’s no reason to save these accessories for special occasions. You can make every outfit into an outstanding ensemble with just a few simple tricks!